Summer Sizzle in Effect with PiMP July news! | PiMP OS and Miner.farm: the fastest and easiest way to mine ALL crypto currencies. Summer Sizzle in Effect with PiMP July News! miner.farm 3, control multiple farms, gputool improvements, and more! Summer is in full swing for most pimps and we are keeping our rigs hot and our wallets piling high with coins. Lots of big changes in the pipeline for pimps including big AMD driver upgrades, major stability fixes, and better tuning ability! HOT Breaking News! PiMP Referral program is now live. It’s now fast and easy to refer others to PiMP OS and earn commissions. Earnings: 10% of net sales you refer. PiMP has always been the advocate for crypto currency miners. By signing up to participate in this program, you will be held to PiMP’s referral agreement. Here’s the tl;dr, but the full program rules are located at getpimp.org/terms. Generate your Affiliate link and share it with others. DO NOT SPAM WITH OUR LINKS. Please be ethical and act as a good example in the crypto community. You may use our banners, logos and icons to promote on your blog, your Facebook, Youtube channel, Snapchat, Twitter. Affiliate links that result in a successful, completed purchase will produce a credit on your account equal to 10% of the net sales. Credit earned can be redeemed for credit for PiMP and Miner.Farm purchases. We have been working hard on the next generation of the Miner.farm service. Continuously evolving the platform and services based on the needs of miners everywhere. Version 3 is a complete rewrite from the bottom up, including all infrastructure services. The new architecture is scalable, responsive, and dependable. Backward compatible with all existing versions of PiMP, making the most requested new features simply plug and play. ALL NEW Integrated account management: miner.farm and PIMPOS keys all in one easy to find location, along with a complete history of transactions and changes to your account. We are finally able to bring you total control of your information, keys and farms all in one place! Accounts will be able to have more than one farm, allowing you to more neatly divide your operation into production and development, or manage multiple farms for different customers. Resellers will be able to build up and transfer farms to their customers (based on additional Resellers package, details TBA!). PIMPOS Key management is simple and direct. Reset your own key – no more waiting between reimages! 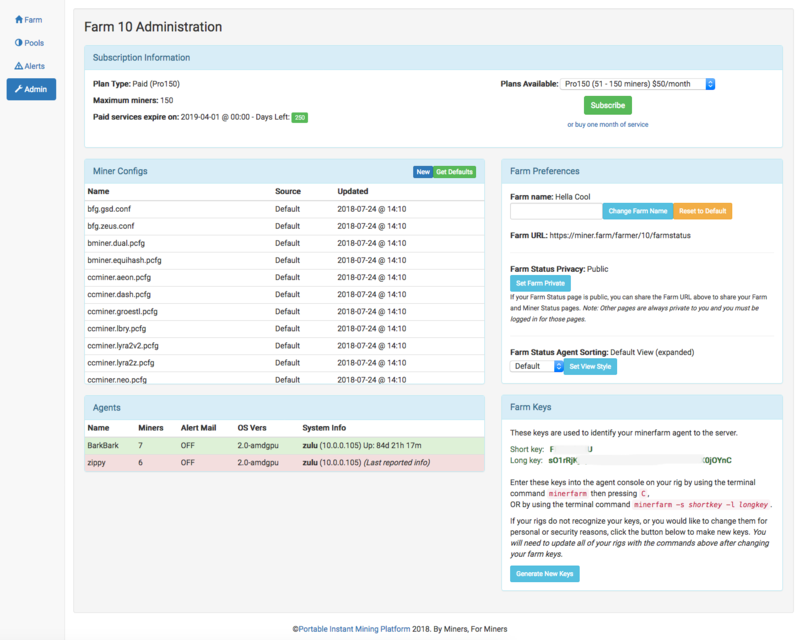 Introducing the ALL NEW Farm Admin page, where you can manage settings, agents and configurations for each farm. A new Miner Configs tool will be here; it will allow you to import and export configurations from agents to your Library, and edit them as needed. This is a long requested feature in miner.farm, and we are excited to finally be able to bring it to you! 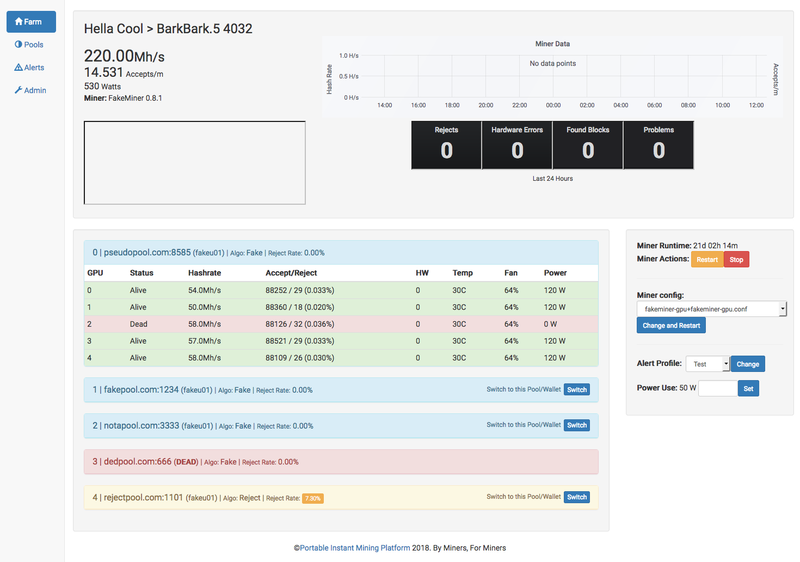 We have moved the miner controls to an easy to get to panel, and are now displaying power usage per miner! This is valuable information for making crucial mining decisions. You can set a baseline power usage for the rig itself, and it is added to the reported card values. This total is also reported at the agent level in Farm View. PiMP OS 2.8 is coming, based on the brand new Ubuntu 18.04 LTS Bionic Beaver with the latest AMD, NVIDIA, and CUDA drivers. PiMP dev and beta team are working around the clock to smooth out every last bug and provide the stability and worry-free reliability that you have come to expect with PiMP OS. 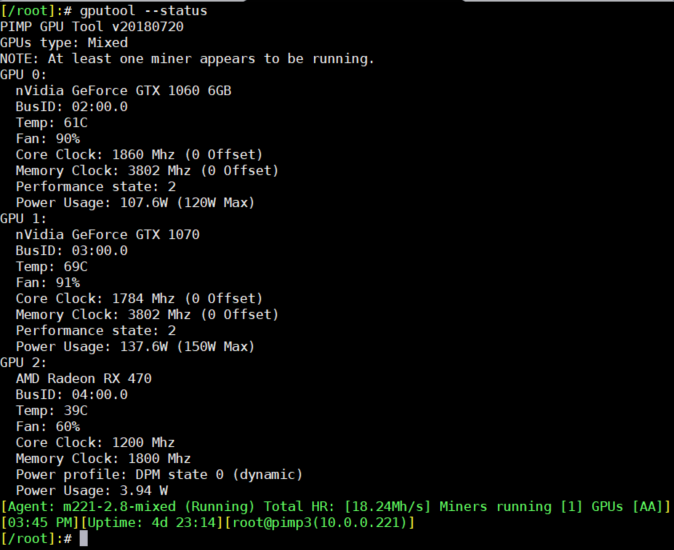 Currently, PiMP OS offers outstanding hashrates on AMD cards with a simple One Click Strap mod and gputool overclock. For NVIDIA all you need is gputool. This is all included in current versions of PiMP. Moving forward, we plan to use this kernel+driver platform as the base for 3.0. We will be showcasing upcoming headline features for 3.0 in the coming months. 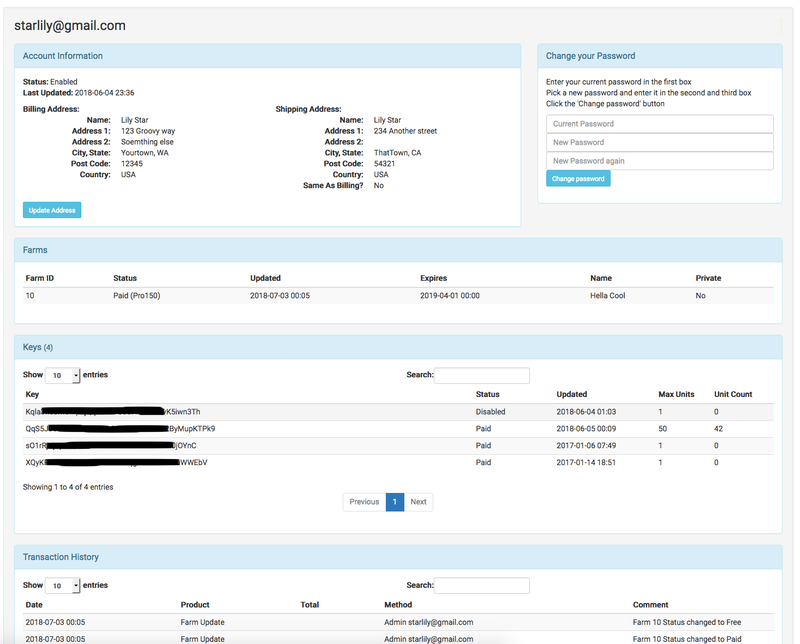 Notably we will be providing a backup/restore feature to make rig deployment even faster and easier. Make sure to check the changelog every couple weeks! gputool gets a makeover with a ton of formatting and guidance prompting, easier to read output, better error checking, human-readable gputool –update, and the centerpiece: you will be able to define your gpus in the gpu-config file based on busid, so your settings can follow the cards when you’re working on your rigs. Thanks again to Doc for being the Support MVP this month and making a ton of great videos to help pimps get going faster. Interested in getting a taste of 2.8 before it’s released? Get a look in behind the scenes on PiMP development by joining our beta team. Exclusive content on the forums, direct contact with the devs, and all of the sweet PiMP updates before they get released to the public! Check out https://getpimp.org/beta for details! Miner rollups for July included the latest updates to bminer, claymore, and a welcome-back to ewbfminer, the current choice for nvidia x16r/xevan/phi and some equihash variants. As always, We work with the miner devs on your behalf so that we can get good quality code that works well for pimp rigs. The Terms and Conditions at getpimp.org/terms were updated to include the new Referral Program terms (getpimp.org/referral-terms), as well as getting the new “My Referrals” page for signup and stats, and all of the new Ad Banners. Front page got cleaned up and the new green/gold color scheme has been applied to the forum and the sales site. Still tweaking to make it as nice as possible. This year we launched our CLUBHOUSE CALL for all PiMP lovers and customers. Join the call on Discord (Every Wednesdays 6pm EST/3pm PST) to get face time with our dev team, hear the latest product updates, and updates with our beta team. So far it has been great talking with all of the miners and pimp team about GPUs, cooling, mining strategies, and fun ways to spend coins. Latest topics discussed: airflow, cooling, equihash variants, nvidia GPU supply, and optimizing for older equipment. Thanks for reading! See you in the Discord Chat! From all of us at the PiMP Team, thanks for supporting PiMP OS and Miner.farm!